Just one train in two will run from Paris's normally busy Montparnasse railway station on Monday, as engineers work to restore power following a fire at an electrical station on Friday. Rail bosses say only 50% of trains will operate the Montparnasse station on Monday, three days after the fire in Issy-les-Moulineaux, southwest of Paris, shut down all rail services to and from the station. Scores of trains were cancelled on one of the busiest weekends of the year as tens of thousands of Parisians were due to head away on holiday. The effects were felt as far away as Dax on Sunday, as staff ordered 150 people off an overcrowded train. SNCF has added extra carriages to TGV trains. But some 115 mainline trains to and from Montparnasse have been cancelled, or rerouted to run from nearby Gare Austerlitz. Engineers have said that full power will be restored before Tuesday evening, having initially said it would take until Thursday before services could resume as normal. 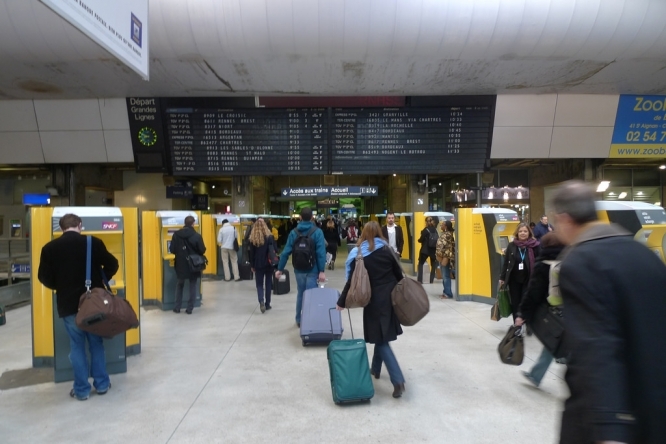 Passengers without a ticket have been asked to delay their journeys, if possible, while those with tickets should visit the SNCF website for the latest information. For a complete list of all SNCF's cancelled trains on Monday, click here.